Here we will look at FOREX price action and see why its so popular, what the advantages of it are and what are the drawbacks of this method of trading are. Price action trading is based on trading the naked price chart and uses no indicators whatsoever - there are no momentum indicators such as the RSI or stochastic, no moving averages and no volatility indicators, you simple look at the chart trade support and resistance and look at the open, high, low and close on a bar or candlestick chart. The logic is that all the fundamentals and the sentiment of all the traders trading the currency pair are reflected in the currency pair you are looking at. You are seeing the true price clearly in front of you and if you have the right strategy, you can develop a high probability trading strategy which will help you make consistent profits by simply trading the price. It sounds simple and it is and this method of trading has both advantages and disadvantages so let's take a look at them. The major advantage of price action trading methods is there quick and easy to learn and they are very simple in terms of design. We have always believed that simple trading systems work best but is this method of trading to simple to make money? I don't think so, in my own view you can make money trading price action and I will give you a couple of simple price action trading strategies later which will work that are so simple they can be learned in a few hours. My major comment would be price action trading methods you need to be applied to longer term time frames, just like with any other FOREX trading strategy. 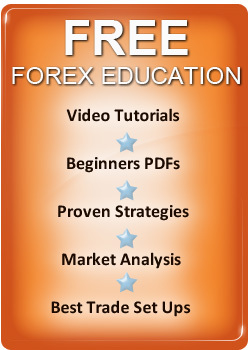 You won't make money, trading currency charts using short time frames of just minutes or hours! As we discuss elsewhere on this site the idea of scalping or day trading is a complete waste of time and effort, most traders do it and most lose so don't be tempted to join them. Even a good price action trading system (or any system) will fail in short term time frames. The minimum time period you should look at is a daily chart over 2 months and it should be backed up by the weekly or monthly price chart. I read a lot of price action traders who say indicators have no place in FOREX trading but I would disagree. There is nothing wrong, with using indicators at all and they can give you a greater insight into where price movement may take the chart next. While we base our trading methods on the charts price action by looking at moving averages, momentum and volatility, we get a much deeper insight into the chances of a trading signal being a good set up or one we should pass by. Having said this, indicators in our view are backup tools and market timing should come from the chart and finally, you should only use a few indicators not a strategy crammed full of them. There are many ways to make money trading currencies and pure price action trading is just one of them. The techniques on a daily chart need to be fluid and you need to learn to see each set up individually on a the currency pair you are trading. This requires practice and being flexible in your trading approach. My preferred way to trade price action set ups is to look longer term. Trading the daily chart (a minimum 2 month time frame) and trying to line up important levels of support and resistance on the daily, weekly and even monthly chart. When combining a daily and weekly chart for example, you won't get many signals but the ones you do get with have a high probability of success. I will come to some very simple trading systems in a moment. Most price action strategies tend to focus on candlestick charts rather than bar charts to improve market timing and most are based on breakouts. Trying to work out if a breakout is false or one which will follow through and the way this is normally done is with candlestick charts. Here are a couple of very simple price action trading systems which will make long term profits and the first one is a trading system which will produce more profits than just about any other price action trading system and is loved by true professional traders it's Richard Donchian's 4 Week Rule. We have discussed this in detail elsewhere on this site and it's the simplest price action system for profits you can get. because it has just one rule to generate a trade in the market which is buy a break of resistance to a new 4 week high and simply maintain an open position in the market until a break of 4 week support occurs and go short. How simple is that? Well it is simple but it does work and you can read more about this Simple Breakout Trading System on this site and download a FREE PDF which explains the logic and why it works in more detail. Price action trading methods are just another way of trading currencies which can make money but is this strategy the best way to trade currencies for profit? Some people think they are but for me, in short term time frames (even on a daily chart) they generate to many false trading signals and tend to suffer to much draw down although, I do love the 4 Week Rule but due to it's tendency, to have periods of losses in the short term when markets move sideways, it must be traded on a spread of currency pairs which means a well capitalized account. Also using daily, weekly and monthly charts combined which we looked at earlier, can also work well and is very simple but this method will also tend to need a wide stop loss on entry. In conclusion, price action trading strategies can work but as with all trading methods it's not the holy grail of FOREX trading many people believe and the best price action traders I know, are very subjective in their application of this type of strategy. You can explore this method of trading which it is a quick and easy strategy to learn and apply but be warned - you will need to practice a lot, get a feel for the chart and be very flexible in terms of your trading technique but if you can do this, you can enjoy long term currency trading success by trading price action price set ups. One of the best ways to get started in Price action trading is to use Breakouts and if you use the info on this site, you will soon be trading like a pro with this method. FOREX trading should be simple and Simple Trading Strategies always work best so don't work harder than you need to when devising a trading plan for success.